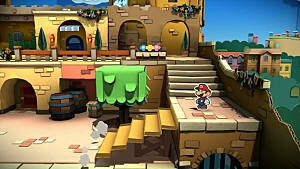 The recent bout of portable and console Paper Mario games have strayed from the well-established RPG formula used in the original titles, causing the very identity of the series to decay. The series simply doesn’t feel like it once did. 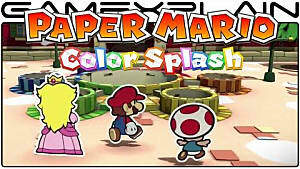 The transition began with Sticker Star and continues in Paper Mario: Colour Splash, though to a much lesser extent than its handheld predecessor. What once began as a competent RPG series, albeit with far fewer intricacies than a traditional game within the genre, has become a mess of action, adventure, and RPG elements. Combined, these genre crossovers don’t make for very enjoyable Paper Mario games. 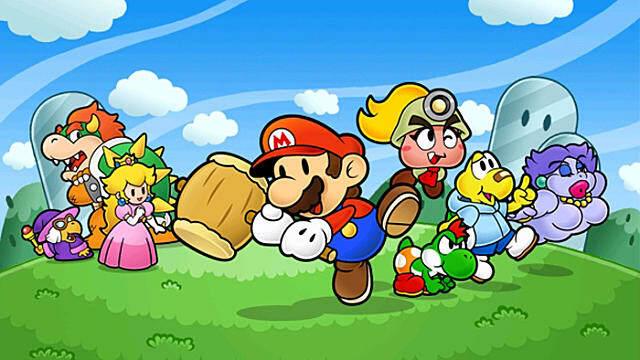 Certain advances are totally acceptable when it comes to modernizing a franchise, but I’m sure many fans have easily detected that the Paper Mario series has been superseded by the Mario and Luigi series. The comedy and nonsensical joy inherent in the Paper Mario series is still there in Sticker Star and Color Splash, but the battle systems and travel systems have all been replaced with features that aren’t all that compelling. 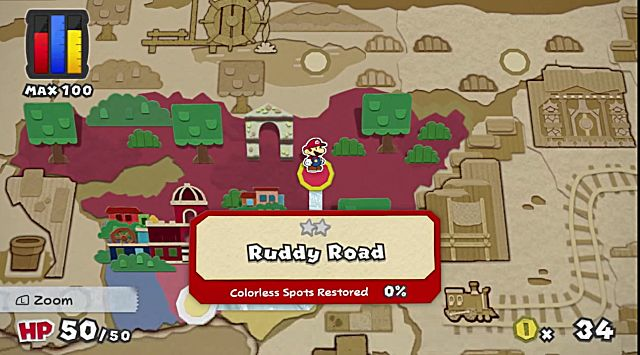 A total shock to the beloved series, Paper Mario: Sticker Star does away with the leveling system by forcing you to collect stickers as a stand-in currency for attacks. In the former games, basic attacks would permanently exist, and only specialized attacks required collecting. And even once you've discovered these specialized attacks, called badges, you’d be able to use them during any battle, so long as you had enough BP to do so. 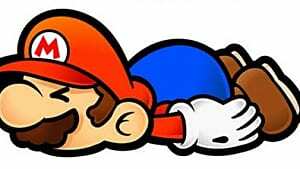 The worst feeling in both Sticker Star and Color Splash is running out of attacks. Because you have to find attacks -- yes it sounds weird to even mention it -- they can run out rather quickly if you’re not careful. But this type of management is not fun or complex in the way that conserving SP or items is. If you’ve run out of stickers in the 3DS game, you have to go hunting for more moves, and in Color Splash you have the option of spending coins once a turn to nab an additional attack, but it’s all so tedious. Just include the attacks and make the battle systems more robust! In previous games, when a battle began, you’d get right into it. In Sticker Star you have to select a sticker from your collection on the 3DS touchscreen; even worse, the Wii U Paper Mario has you select and ready battle cards from the GamePad, paint them, confirm that painting is complete, and then swipe them up to the battle screen on your TV. It’s obnoxious and needlessly obtuse. Paper Mario: The Thousand-Year Door did not subscribe to this kind of tedium. You were able to attack at the start of battle with a quick selection screen, and the complexity was found in the various party members you took along with you on your journey. That’s how it should be done -- complexity in battle systems should not mean profuse frustration caused by cumbersome selection sequences. The complexity of the battle systems in the new games are more with the battle procedure than the battle itself. The most apparent loss when it comes to the systems adopted by modern Paper Mario games, is the leveling up system. As mentioned earlier, Paper Mario: Sticker Star made the audacious move of sacrificing statistics for stickers, and what is an RPG without stats? Perhaps it was a calculated maneuver to make the series more viable for youngsters playing on the go, but it’s not a decision that I see benefitting the series. 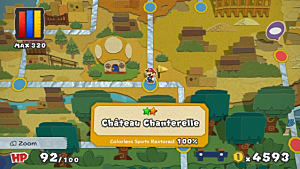 In the original Paper Mario and Paper Mario: The Thousand-Year Door, Mario leveled up by collecting 100 stars gained from battle. You could then up his stats like HP, FP, or BP, leading to a sense of progression. In Sticker Star and Color Splash, there aren’t really any progression systems that make battling feel like an endeavor to advance Mario’s abilities, save for the ability to upgrade Mario’s paint hammer in the latter title. Even then, it’s only a twinkle of an RPG element. This omission really makes battles feel inconsequential. Every battle encountered only serves to progress the game. The lack of a feedback loop points to a once-RPG gone rogue, then having its identity pulled from a bunch of other genres, however, this isn’t a good look. Say what you may about the recent Mario and Luigi games, but they have certainly come into their own. Though they may be riddled with awkward text and some uninspired locations lending themselves to bland stories, but the battle systems are very RPG-like and quite varied. 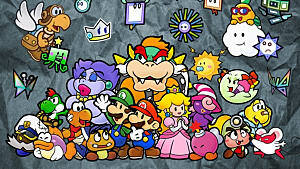 The series, once an interesting derivative of the Paper Mario series, or the other way around depending on how you look at it, now employs systems that should have been injected into the new Paper Mario games. 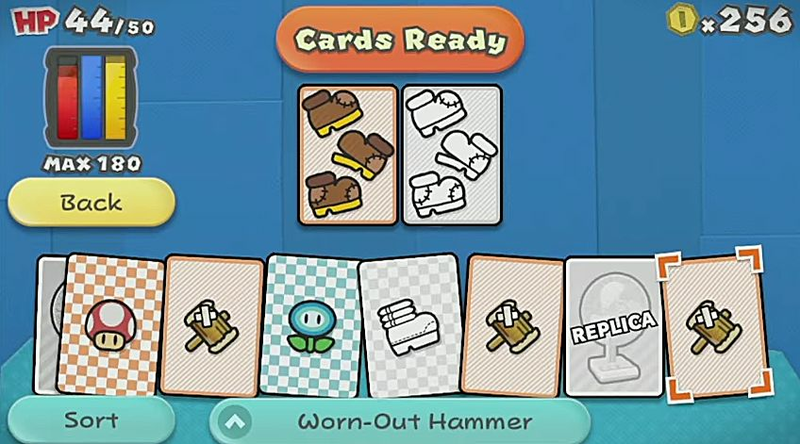 In Paper Mario: Color Splash, after the ritual of selecting and painting battle cards, you are treated with an effortless A button command used to execute attacks. Whether you’re attacking with Mario’s crushing boots or heavy-headed hammer, the input method used to initiate the attack is all the same. Needless to say, it becomes rather tiresome after but a few turns. 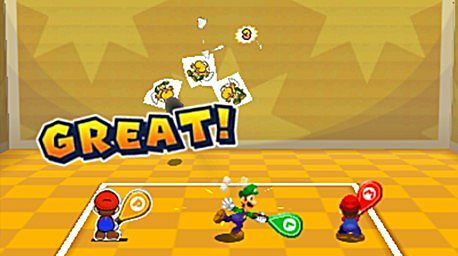 The latest Mario and Luigi game, Mario and Luigi: Paper Jam, made use of bountiful RPG elements when it came to battle. 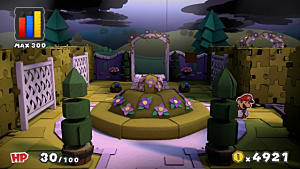 The Bros. attacks offered varied gameplay in the middle of battle, tasking both brothers and Paper Mario to use unique input patterns to conquer their enemies. It’s a much better approach than timing presses of the A button to win. 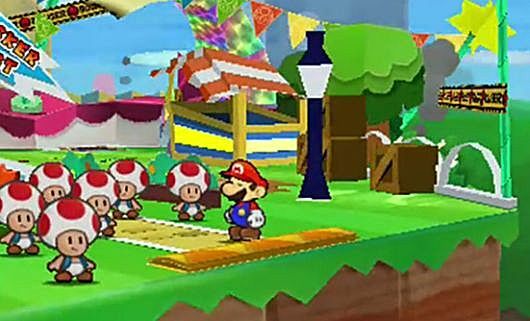 More than just the battle system melting out of the series, recent Paper Mario titles have taken systems that don’t make much sense; unless, in some sick twist, the creators want to make the Paper Mario franchise a Super Mario Bros. game. I’m talking about the use of overworld map screens. My revulsion toward a map system may seem a little misplaced, but let me remind you that it’s the map system that lays out how the game will progress. The map systems guide and segues one sequence of events to another, making the newer Paper Mario games feel more like short levels than fully developed areas. And maybe that makes sense for a 3DS game, because you can pick up the game and play in short bursts, but for a console Paper Mario, I refuse to believe the staccato approach is better than the exploratory experiences offered by the senior games. 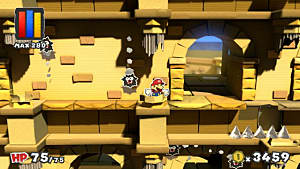 If Super Mario 64 and Super Mario Sunshine are akin to the Paper Mario of the past -- with enclosed spaces that include more than one objective hidden amongst other interactive elements -- then the Super Mario Bros. games are akin to the current generation’s Paper Mario titles -- with short, often linear objectives to reach the goal. I know, I know. You’re probably freaking out about my omission of Super Paper Mario, the Wii game that played ever so closely to a Super Mario Bros. game. I’ve left that game out of the argument because it did maintain the deep RPG elements of previous titles. 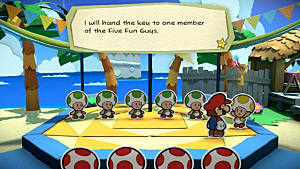 Even though it did away with the turn-based systems emblematic of the series, the level grinding, puzzle elements, and party systems remained secure. It may not be popular opinion, but I think Super Paper Mario did an admirable job of upending the tea table while still oozing with Paper Mario traditions. When Paper Mario: Sticker Star landed in my hands, it wasn’t hard to tell that the removal of the battle system made the game suffer. 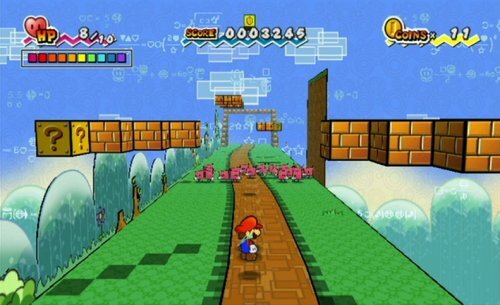 In Super Paper Mario the dimension mechanic that enabled you to switch the game from 2D to 3D, along with the exclusive abilities of the Pixls, more than made up for the neglect of the battle system. With a well-balanced approach to game design, Super Paper Mario was deserving of the illustrious Paper Mario name. There is much to be done when it comes to reeling the series back in. 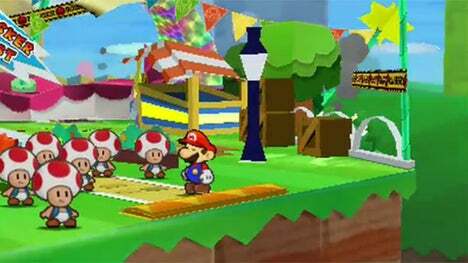 Paper Mario: Color Splash does do a better job than Sticker Star did, at least with the frugality imposed by the paint system exhibits a glimmer of RPGish elements -- but the progression systems, and puzzle-like elements provided by the inclusion of party members are all lost. That and the structure of the game remains more portable-inspired. 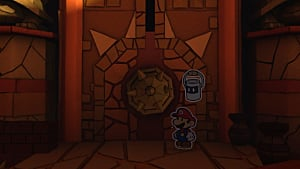 Hopefully, once the stickers fall off, and the fresh coat of paint dries, a new Paper Mario game -- something a little more rooted in its days of yore -- will show up on the Nintendo Switch.